It’s been a few days of rich and bountiful eating, so I decided to go for something lighter, not to mention the cucumbers and tomatoes, so fresh a few days ago, were in danger of getting overripe. It’s immediately obvious to me what to do with these two delicious and cooler summer vegetables (technically fruits to the pedant). In a Spanish-speaking country where I could get sherry vinegar, and if I had a blender, it’d be gazpacho. But šopska salata is also a fine choice, especially given that the stalwart Italian PX stocks DOP feta cheese. Now, I’m treading into the Balkans here, and I know that emotions run high about most all questions of national identity in that part of the world, and I know the Greek battle to secure DOP labeling for a kind of white sheep milk cheese that is produced in innumerable forms all over the Balkans was seen as a nasty nationalist move by many. But this is war zone cooking, and although I’d prefer real sirenje, that ain’t happening, and DOP feta is not a bad substitute, especially for my countrymen used to eating bland and hard stuff at salad bars and in gyros most of their lives. I can’t think of any foreigner who, when traveling in the Balkans, didn’t immediately fall in love with the šopska salata. (I feel particularly strongly as I lived in the Šopluk for a bit.) Now, there is a lot of information on the internet about what is and what isn’t in a šopska, which seems common to all ultra-simple regional foods. 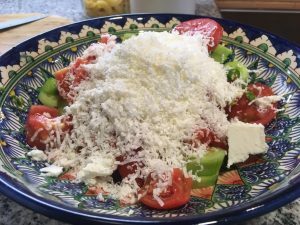 What I knew was this: the freshest possible tomatoes and cucumbers, cubed, topped with the most finely grated sirenje. Maybe a single black olive for decoration at fancier places. Possibley trace amounts of sunflower oil, not that you could taste. To Americans used to bland, tasteless iceberg topped with ranch or thousand island dressing, this was a new frontier in salads. In the cafés in Belgrade, they’d add some finely diced and fairly hot fresh pepper. Every few bites, you’d get a bit of heat that could be instantly ameliorated with the cooling cucumbers and creamy cheese. Delightful on a sweltering summer day. That’s what I replicated here, to, I think, great effect. My only gripe is that the south Slavs rely on sunflower oil far too much. With a few drops of Zucchi organic, it was delightful. My only regret is not having some hearty Macedonian white bread to sop it up with. I should probably have a post at some point about similarities between the Balkan and Central Asian kitchen — the fresh vegetables, grilled meats, and good bread all doubtless have Turkish roots. But that’s a subject for a different post. It’s a long weekend, so another day to cook. We’ll deviate from the usual Italian theme due to availability of local produce. Having come into a large quantity of okra, I was at somewhat of a loss as to what to do with it. Of course, as a good southerner, I have nothing but the fondest memories of my mother’s fried okra, but I’m lacking both my cast-iron skillet and cornmeal. Unfortunately, I’m also missing the requisite South Asian spices to make a good bhindi masala. But this is war zone cooking, so it’s all about improvising, using what’s at hand, and not wasting good fresh vegetables. After a good amount of research, I decided to try this recipe, which ultimately morphed into a gumbo-inspired dish. 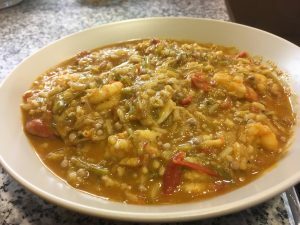 After all, gumbo comes from the Angolan word for okra, kingombo, still seen in today’s Portuguese, French and Italian terms for the green ladyfingers so popular in the southeastern U.S. The main challenge in making good okra is eliminating the so-called slimy texture from it, produced by a substance called mucilage, which you’ll certainly feel when you slice it. This is why some recipes recommend not slicing small okra, as well as drying them well, soaking them in vinegar, and various other remedies. I don’t find the texture so objectionable, especially in a soup or stew. At any rate, I washed and dried mine well before cooking. I used a high-walled saucepan and made soffritto of onions (finally, fresh ones), garlic and EVOO. Then, as I cut the ends off the okra and cut them into fairly thick slices, I tossed them in. This was with fairly high heat, so I added a cup of water to mediate burning. 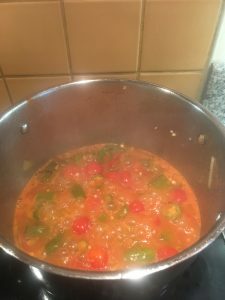 I also added two long hot green peppers, fully intending to take them out later, as I’d learned my lesson with heat from the peperonata a couple of days ago. The chopping took awhile, and when all the okra was in, I added cumin, cayenne and paprika (I didn’t have turmeric). I mixed it all, turned down the heat, and added more water and a teaspoon of chicken stock (Better than Bouillon, Amazon). At this point I took out the hot local peppers, which had cooked down plenty and shed their seeds in the base. Finally, deciding to fully abandon a truly South Asian recipe, I added a few slices of salamella calabrese (subbing for andouille) and some pilaf-style long grain rice (gifted by some anonymous person departing). NB: the rice will quickly soak up the moisture, so beware if you turn your back to take a phone call or update your blog. This is a good point to put in a bit more water, q.b. I turned down the heat and then, when it was almost done, added all 300g of the frozen shrimp (Italian PX), some frozen parsley (ditto) and turned up the heat a bit, again, stirring constantly. Then I let it sit for a good hour to come together well. Verdict: I was a bit too heavy-handed on the cayenne, being so used to Italian peperoncini that I forgot the heat this powdery stuff has. 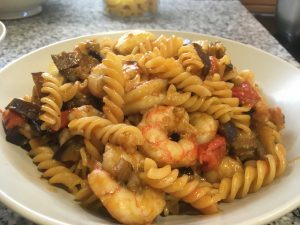 Despite tossing in the shrimp at the very end, they were a tiny bit overdone for me — I think these frozen ones adapt far better for the high-heat, flash-frying style of Italian pasta condimento than the slow-simmer that a gumbo needs. The salami added good texture and went well with the rest of the stew. As to the dreaded “sliminess” of the okra, first off there’s no avoiding it in a slow-cooking recipe, but I found nothing objectionable about it. I mean, it’s a stew, so one expects it to be wet, or, better said in Italian, in umido. I’ve saved half and fully expect it to be enjoyable the next day. Cooking, being an inexact science, sometimes surprises and sometimes disappoints. It reminds one of musical improv or other strange mixings where sometimes, you can follow the instructions and end up with an inferior product, and sometimes, it all just works. If yesterday was the former, today was the latter. An adaptation of this. I’m intrigued by seafood and eggplant dishes, so expect another similar dish to follow, perhaps with mussels. It’s a very southern combo, quite different to the cucina veneta that I know best. I think one thing that made a difference is that I salted the eggplant for much longer than I intended. I sliced thin, then cubed. I also scored some wine, really the remains of a bottle of 13% American chardonnay and thus not suitable for drinking, but perfect for the magic that cooking with alcohol seems to bring. (My brother, who makes me look like the amateur that I am, is more aware of the chemical reactions involved.) I also washed and dried (as best I could) the slices before cubing. While this was going on I was thawed my Italian branded, but Thai-caught shrimp. Sautéed one large garlic clove, added the eggplants, let them get soft, added a good dash of the wine. Put on the pasta water to boil. I am lucky enough to have fresh basil growing outside (yes, war zone herb garden), so I topped with that, frozen parsley and dried oregano. Mixed well with a dash of the pasta water and let it evaporate. It came out smashingly. I’m surprised I was able to control myself enough to save some for later. I had a healthy appetite thanks to this morning’s 10K — although war zone running is perhaps best left for another blog. Now, off to the PX to see if they’ve resolved their shipment issues. If nothing else, I need some more canned tomatoes. I invite readers to send in ideas for okra. By dint of kindness and good luck, I obtained three bags of fresh veg lately — eggplants, fresh tomatoes (thankfully, since the ones flown into here are a crime), okra, peppers, onions, and cucumbers. 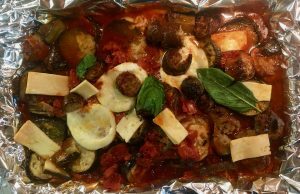 So what to do other than to make one of the delicious Mediterranean eggplant and pepper dishes — in France it’s ratatouille, in the Balkans it’s pindjur or ajvar, and in Italy, it’s peperonata or parmigiana. Having already covered the latter, I thought I’d do the former. I thought the peppers were sweet, and even tasted one, but some hot ones got in my batch, so mainly I was worried that it’d be too hot. Hot it was, but not inedible. I didn’t really have enough time to do a fully 80-90 minute bake, so I cooked on the stove and in the oven. As with all eggplant dishes, I sliced and salted first. I had the makings of a Northern-style soffritto in my fridge from the salad bar (diced celery, carrots and onion). Not normally to be used in a Southern dish, but waste not want not. I tossed that in, along with a garlic clove, then the salted and washed eggplant slices, and let it cook down. Since eggplants are a sponge that will take as much EVOO as you have, I had to add a little more oil to prevent sticking. After that mix got soft, I added a can of these excellent Victoria cherry tomatoes (I’m saving the fresh ones for salad or seafood dishes). Then I added the chopped peppers, long green crooked ones, and (since I thought they were sweet) a dash of red dried peperoncino and some oregano. I let the mix cook down over fairly high heat as I boiled water for the gomiti and penne (figuring I’d uphold the cucina povera Neapolitan tradition of mixing leftover types of pasta). I’d pre-heated the oven, so I tossed the peperonata in with a liberal amount of grana padano (again, I’d rather use pecorino but I’m hoarding it for later — this is war zone cooking, c’mon). When the pasta was al dente, I removed it from the oven and tossed everything, along with a spoonful of the starchy reserved water. It was decent enough to where I finished the whole thing. I think it would have been better the next day, maybe. I also might’ve liked the blend the ingredients together for a smoother consistency. I definitely would have used less hot peppers (and I like hot). Not bad, but seemed to be missing something. Maybe the Northern soffritto was a mistake. At any rate, it was nice to have fresh vegetables. 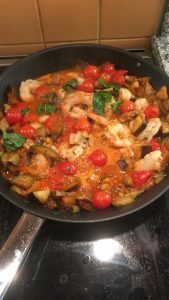 Today: some manner of shrimp and eggplant dish. With the leftover pancetta from the amatriciana and some frozen bietola, I had a couple of options. Basically an amalgamation of these two recipes. I did a soffritto with EVOO, frozen onions (working on obtaining fresh ones) and peperoncino while I boiled the bietola. I had the rind (cotenna) of the pancetta, so not wanting to waste, I threw that in and let the fat render down into the EVOO. I took a break from cooking and eating as I had another stomach bug, the second in as many months. M&M Enterprise Cooking started as a way to avoid food-borne illness but there are a lot of ways to get sick. As a colleague asked, “did you touch a doorknob?” So as long as I’m able to handle it, M&M will continue. Today I went ahead with the plan to make spaghetti all’amatriciana. 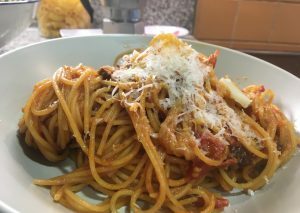 Amatriciana, like many simple regional dishes, has many variations and there are a lot of opinions about it: onions or not, white wine or not, pancetta or guanciale, spaghetti or bucatini. I’ll leave it to the curious to look around the internet, although I’ll caution all readers against the New York Times article of January 2008, which exacerbates a number of ridiculous misconceptions about Italian cookery that American travelers have. 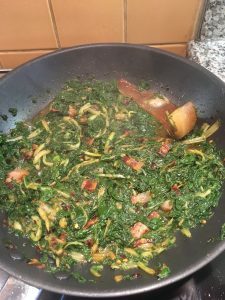 This simple and inexpensive dish was a go-to for my Veneta wife and I when we were dating and first married, so I’ve used a variation of her recipe, which differs from stalwart Giallo Zafferano’s in that she never reserved the guanciale/pancetta. What can I say, she’s not from the south, but lived with meridionali for a long time. I prefer to add a bit of wine, but it’s not easy or cheap to get alcohol here, so I forwent this time. As per usual, the first thing you always do for timing is put on the big pot of cold water to boil for the pasta. Unlike the wine, I was able to obtain a 200 gram piece of pancetta tesa from the ever-reliable Italian PX. I used somewhere between half and three-quarters of it, cutting off the rind and reserving it for a later bean dish. I cut it straight through, leaving a hunk of pink meat in the middle and fat on either side. I tossed that in some good EVOO and added some frozen onions (Italian PX, hard to get fresh here). This is where it gets tricky — the onions will burn quickly, and you want all the pork fat to cook off into the EVOO. I managed to avoid burning, but my onions got a little more caramelized that I’d normally prefer. I then added some organic red pepper flakes (these came from Amazon). Next, I tossed in a 400g can of good cherry tomatoes (Victoria, €1.90, Italian PX). I turned up the heat a bit, now that I had some liquid to prevent burning, mashed the tomatoes and kept stirring till it all got to a good consistency. The Granoro spaghetti (half of a 500g pack, €1.50 at the Italian PX) cooked al dente in about four minutes (always undercook a little, as you’ll finish it all in the pan). As I was draining, I added some of the starchy water to the condimento. 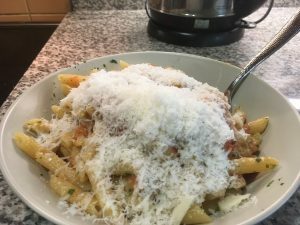 I mixed everything, as one must do, while adding liberal amounts of Grana Padano (the PX has been out of the more authentic Pecorino Romano for the past two weeks). I plated it carefully, added a tiny bit more cheese, and tiny bit of the Zucchi EVOO (not what I used for cooking). The result was better than I expected. It all came together well in the mixing, and the pasta itself absorbed the wetter parts of the sauce. The peperoncini and pancetta conspired to make a smoky, earthy flavor. My only regret is that some white wine would have brought that out more, and pecorino even more. There’s still a hunk of pancetta left, so there’s a chance to revisit. Humanitarian note: don’t forget that Amatrice, the town the dish gets its name from, was hard-hit by an earthquake two years ago. There’s a festival promoting their local culture starting today, if you’re in the region. Next up: cooking with frozen seafood, something the PX seems to never run low on. Here’s an easy one, with a Balkan touch. 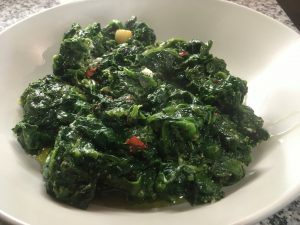 Frozen spinach, courtesy Italian PX. Immersed in boiling water for 3-5 minutes, then drained and put into the waiting pan with Zucchi EVOO, a garlic clove (bazaar) and a finely chopped red pepper (DFAC). Let sauté till the oil is absorbed, add chunks of DOP feta (again, Italian PX), mix well, serve. If the peperoncini prove too much, calm the system with some Twinings nighttime calm camomile and peppermint tea (Amazon). Why saltati? From saltare — they’ve jumped into the pan (and hopefully into your mouth). Five tomatoes and a long hot red pepper sitting in my fridge for a week meant that it was time for this dish. This is about as simple as it gets, so the real challenge here was properly skinning and seeding the tomatoes. 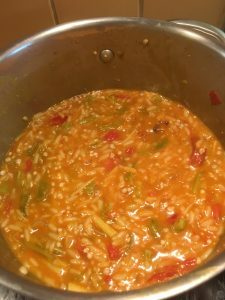 I basically followed this recipe by Giallo Zafferano’s Sonia Peronaci to the letter. My mom taught me her mom’s method for peeling tomatoes — immerse for a few seconds in boiling water, run under cold water, and then the skin comes off easily. Grandma would apparently then just squeeze them directly into the cooking vessel. (She was of Scottish, not Italian, extraction.) This method is fine but it’s a bit hard on the old hands. 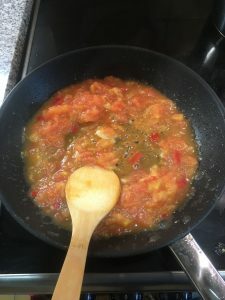 Sonia’s method, which calls for making an X-shaped cut on the top of the tomato and then immersing in a bowl of ice, offers a slight improvement. Granoro penne, the end of the DOP pecorino (which, I note, to date has not been restocked), frozen parsley all from the Italian PX. Tomatoes from a vendor at the bazaar. Chili pepper from the cafeteria. Also a bit of organic Zucchi EVOO at the end. The problem with this dish, like with the shrimp, is that the tomatoes on offer are simply not that juicy. I used five, which seems way too many for one dish of pastasciutta normally. But these things don’t cook down much, and what juice there is remains thin and watery. Think it would have been superior with some canned cherry tomatoes or passata, which I’ll keep in mind for the next pastasciutta dish — all’amatriciana. As my Italian-American college roommate taught me long ago, there’s something about letting any tomato-based dish cool overnight that does magic things to it the next day. Not a whole lot to say about today’s dish — all the basic ingredients and their sourcing were described in the previous post. 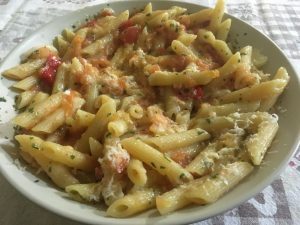 Today’s task was simply to boil water and add Granoro penne rigate for 9 minutes while last night’s parmigiana pugliese re-heated in the oven. 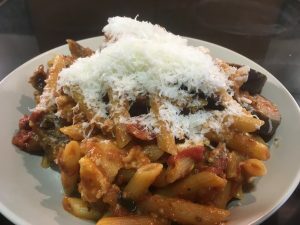 Drain the pasta, mix everything in the pot, top with some DOP pecorino and the organic Zucchi EVOO, and eccociqua — a delightful sort of pasta alla norma con salsiccia. 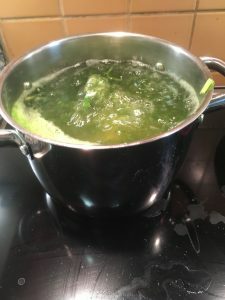 Mixing in the pot is absolutely essential, another tip from my old roommate of origini meridionali I learnt before ever even setting foot in Italy. Yet many non-Italian cooks don’t do it and I can’t fathom why, or why not. 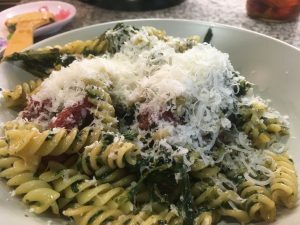 The just-cooked pasta will be porous and ready to accept the flavor of whatever you’re eating it with — it’s a quick and easy trick that adds a lot of flavor. This ties into a greater idea that non-Italian cooks focus on the “sauce” (more properly a condimento) more than the pasta itself — a cardinal mistake in not only my opinion but likely that of 58 million Italians. This 21-year old New York Times article makes that point in excellent detail. August 22. 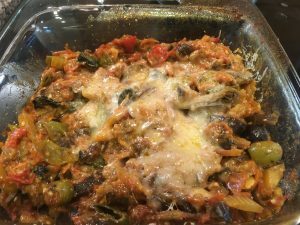 Una specie di parmigiana di melanzane. I bought long local eggplants at the bazaar last week, sautéed them in Spanish EVOO with garlic, layered with them cafeteria provided mozzarella slices, threw in some gifted modest tomato sauce (Hunt’s in a can, Prego in a jar), baked for a half hour at 180C, secured cooked Italian sausage from the cafeteria, sliced that and some DOP pecorino, and added it on top, let it bake at 180 for another thirty minutes, let it cool and topped the whole thing with the good Italian organic EVOO and some basil grown in the garden here. Let it cool for a bit and it was fairly delightful. Using substandard tomatoes breaks a cardinal rule, but — war zone rules. 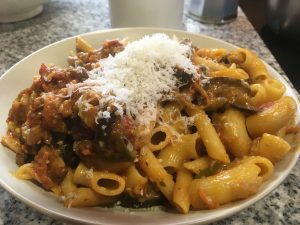 The sausage gives it a Pugliese twist; it’s similar to this recipe, which I found after the fact, although I didn’t batter or deep fry the eggplants. Kept half for today’s penne lunch. Of course, the name of the dish, ubiquitous in east coast sub shops, certainly has little to do with the city in Emilia — this should be a known quantity to all who care at this point — but I was intrigued to learn that parmiciana may come from its Turkish name patlıcan, itself an Arabic borrowing, which was, of course, what we called them in Macedonia as well. The Italian wiki (“Attribuzione siciliana“) has some good theorizing. How the storied fruit of Solanum melongena ended up with so many different names is its own story and the interested should be able to turn up some good explanations with minimal Googling. Here’s one of many, although the author is a little too credulous at times — mela insana (apple of madness) for melanzana is pure folk etymology.